After teasing the arrival of supervillain Negan, Namco’s Tekken 7 has finally given a glimpse of what the leader of The Saviors will look like in action. Similar to his first appearance on AMC’s The Walking Dead, he appears in the darkened woods, with fellow fighters Craig Marduk, Armor King, Julia Chang, Lei Wulong, and Anna Williams on their knees while he playfully decides who will die next. You can check out the trailer in the post below! 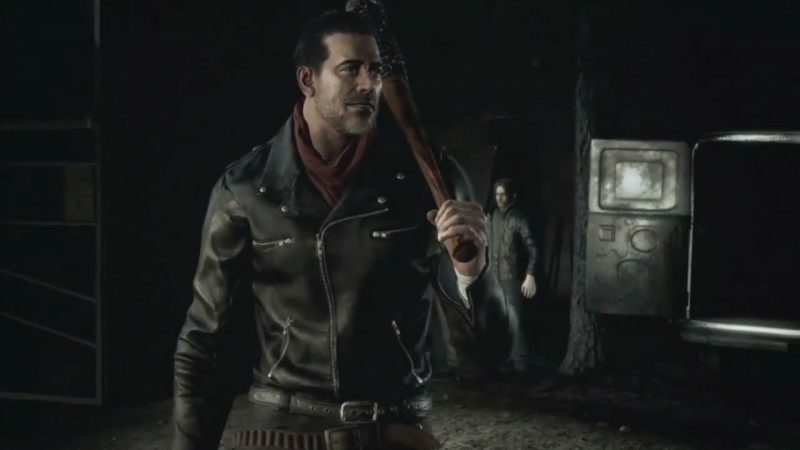 Of course, his Tekken 7 adversaries aren’t going to kneel down and take it, and we see Negan facing off against each of them, showing how he utilizes his trusty barbed-wire baseball bat, Lucille, in regular combat. The Walking Dead supervillain comes as part of Tekken 7’s season two DLC pass. The big bad will be one of 43 characters players can choose from in the ninth installment of the long-running fighting game series. On the small screen, Negan, played by actor Jeffery Dean Morgan, first made his appearance on-screen in The Walking Dead’s sixth season. His charismatic, brutal nature helped turn him into the show’s principle villain all the way through the eighth season, where he was finally defeated by the now-departed Rick Grimes (Andrew Lincoln). Despite his defeat and subsequent imprisonment, Negan still plays a crucial role in AMC’s long-running zombie series throughout its upcoming ninth season.